Promotion: Close Combat - Hell Yeah We're Excited! MINNEAPOLIS, MN – April 1, 2004 – Destineer, Atomic Games, and Gathering announced two new titles; Close Combat: First to Fight, a team-based 3D shooter anticipated to be released in late 2004, and Close Combat: Red Phoenix, a real-time strategy game anticipated to be released in early 2005. 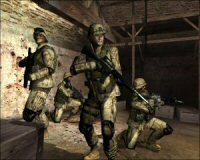 Both games are being developed with the close involvement of the United States Marine Corps and feature next-generation graphics enabled by Destineer’s proprietary 3D engine. Gathering, a publishing label of Take-Two Interactive Software, Inc. (Nasdaq: TTWO), will exclusively distribute both products in North America and publish them in Europe. 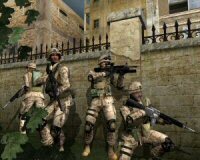 Close Combat: First to Fight is an authentic, team-based first-person shooter created under the direction of active-duty United States Marines fresh from the front lines of combat in Iraq and Afghanistan. 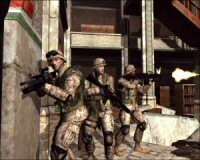 Set in a modern mid-eastern urban battleground, players lead a four-man Marine fireteam through the perils of modern urban combat. Together with the United States Marine Corps and Atomic Games, Destineer is creating First to Fight as a training simulation for use by the Marine Corps and will make it available to consumers in late 2004 for Xbox®, Macintosh®, and Windows®. First to Fight is brought to life by a visually advanced 3D engine created from the ground up by Destineer. This engine, filled with next-generation features like volumetric shadows, normal maps, natural skin lighting and specularity, promises to give players a first-hand look at the chaos and terror of modern urban combat. The next in the series, Close Combat: Red Phoenix™, is a realistic real-time strategy game set on the challenging terrains of today’s Korean peninsula. Loosely based on the New York Times best-selling novel by Larry Bond, Red Phoenix puts players in command of a reinforced rifle platoon of U.S. Marines or South Korean soldiers fighting against an invasion by North Korea in 2006. Red Phoenix is scheduled for worldwide release in early 2005. The original Close Combat® series, released between 1996 and 2000, merged realistic warfare with modern technology. Created by Atomic Games® and originally published by Microsoft®, the result was a groundbreaking game series that went on to win dozens of military strategy game awards, as well as being named by PC Gamer as one of “The 50 Best Games Ever” in October, 1998. More information about these games is available at www.closecombat.com.